Six thousand Muslim clerics are set to gather in Hyderabad on November 8 to issue the “biggest ever fatwa” against terrorism. Organised by the Jamiat Ulema-e-Hind, the country’s largest Islamic body, the meet will have muftis from all states condemning the propaganda that “regards terrorism as synonymous with jihad”. The Jamiat, along with the Dar-ul Uloom Deoband, India’s oldest Islamic seminary, had issued a similar fatwa on May 31, the first of its kind in the country. “The first fatwa was signed by only three muftis. This one will be signed by 6,000 muftis, which means the impact of this will be much larger and deeper,” Jamiat leader Maulana Mahmood Madani told reporters. New Delhi, Nov. 3: Six thousand Muslim clerics are set to gather in Hyderabad on November 8 to issue the “biggest ever fatwa” against terror. Organised by the Jamiat Ulema-e-Hind, the country’s largest Islamic body, the meet will have muftis from all states condemning the propaganda that “regards terrorism as synonymous with jihad”. The Jamiat, along with the Dar-ul Uloom Deoband, India’s oldest Islamic seminary, had issued a similar fatwa on May 31, the first of its kind in the country. “The first fatwa was signed by only three muftis. This one will be signed by 6,000 muftis, which means the impact of this will be much larger and deeper,” Jamiat leader Maulana Mahmood Madani said. The move comes in the wake of arrests of several Muslim youths in connection with a spate of recent blasts. “We want to tell the whole world that Muslims are much better in India than in any other country despite certain shortcomings. Muslims elsewhere or here should have no confusion about that. This is the message we want to convey,” said Madani. The Jamiat also plans to set up counselling centres in every district for Muslim youths who may “easily get carried away by sinister campaigns”. The November 8 meet will also issue a public declaration demanding a “strict anti-communal violence law”, uniform treatment of riot victims, reservation on the basis of population and implementation of the Ranganatha Mishra commission report that has recommended Scheduled Caste status for Dalit Muslims and Christians. Wary of the alleged “pro-American tilt” of the UPA government, the Jamiat will ask the Centre to come clean on its stand on Palestine and Iraq. “The blatant pro-American position taken by the government of late is being viewed by the community with suspicion. The government will have to make its position clear,” said Madani. Despite the accusation, the meeting should allow the Congress to breathe a sigh of relief. It has been facing flak from almost all leading Muslim groups for “targeting the community in the name of terror”. Some have even equated the Congress with the BJP, saying the parties were “two sides of the same coin”. But the Jamiat said it still had faith in the Congress’s secular credentials. “The Jamiat doesn’t endorse comparing the Congress with the BJP. The Congress, despite its many shortcomings, is considered a secular party by most Muslims,” Madani said. We hope the request has been heeded and the present meet will lead to some genuine introspection. The ulema must come forward with visionary guidance for the Muslim community that will help them deal with their own inadequacies and enable them to lead the country on a path of harmony and prosperity rather than remain a community of whiners and grievance-mongers as our leaders have turned us into. It is this whining and constant grievance mongering and spinning of conspiracy theories that is also leading our youth on the path of terrorism. Let us recognise that and act to stem the tide. Blaming others is easy, but let us choose the difficult path of setting our own house in order and setting an example before the country. As a prelude to this declaration, the convention stated: "Islam is the religion of mercy for all humanity. It is the fountainhead of eternal peace, tranquillity, security. Islam has given so much importance to human beings that it regards the killing of a single person the killing of entire humanity, without differentiation based on creed and caste. Its teaching of peace encompasses all humanity. Islam has taught its followers to treat all mankind with equality, mercy, tolerance, justice. Islam sternly condemns all kinds of oppression, violence and terrorism. It has regarded oppression, mischief, rioting and murdering among severest sins and crimes." While Deoband 2008 gives us hope, one cannot but wonder if the ulema indeed have the necessary vision to lead the community at such a sensitive juncture. We will have to engage in some tough debates and take some hard decisions, if we are to save our community from total marginalisation in the country and the world, at least partly caused by the ulema’s own ill-conceived decisions flouting the spirit of Islam. This conference strongly demands the Indian Government to curb those maligning the madrasas and Muslims. The administrative machinery should be demanded to conduct impartial investigations in activities disturbing public peace in the country and to punish only those found guilty. It also demands to free the accused if he is found innocent and punish severely those officials who accused him of crimes of terrorism. No person of any particular community should be suspected without solid reasons. In short, the government agencies must fulfil their duty justly without any prejudice and bias so that real peace and security may prevail in the country. New Delhi, Nov 6 (IANS) From the shootout in Delhi’s Jamia Nagar to Palestine, thousands of Muslim clerics will discuss an entire gamut of issues facing the community at a two-day conference over the weekend in Hyderabad. Many participants Thursday boarded a special train, Sheikh-Ul-Hind express, also known as the train for national integration and peace, from the Uttar Pradesh town of Deoband for Hyderabad to attend the Ijlaas-e-aam (congregation of all) on Saturday and Sunday. The meeting, to be attended by representatives of all prominent Muslim organisations, has been called by the Jamiat Ulema-e-Hind. â€œIt is in line with the tradition of the Jamiat that this call has been given to discuss the issues related to the community. Prominent among them are terrorism and profiling of Muslims done in the name of terrorism,’ said Qari Usman of the 150-year-old Darul Uloom seminary in Deoband. 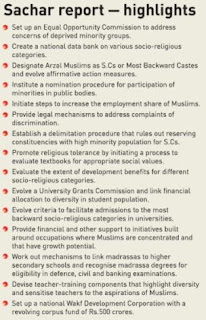 Other issues that will be discussed are the implementation of the Sachar Committee report (which dealt with the social, economic and educational status of Muslims), the Ranganathan Mishra committee report (which recommended reservation for Muslims in education and employment) and some international issues like Palestine and Iraq, he added. The Sep 19 shootout in Jamia Nagar — in which two suspected terrorists that police said were behind the Delhi serial blasts were killed along with a police officer — and the demand for a judicial probe could also be included in the resolutions adopted at the two-day meet. Conferences like these are the best way to attract the attention of the government towards the problems of the community, said Mujtaba Farooq, general secretary of the Jamaat-e-Islami Hind. India is home to the third largest Muslim population after Indonesia and Pakistan. This would put the pressure on the ‘government to take necessary steps to address the issues’. There have been similar congregations held recently. On Oct 14, the Shahi Imam, or chief cleric, of the Jama Masjid in Delhi called an all India meeting in the wake of the Jamia Nagar incident. In May, about 15,000 Muslims from across the country gathered at Delhi’s Ramlila grounds to take a pledge to fight terrorism. Before that, in February, a major congregation of Muslim clerics was held by the Darul Uloom seminary in Deoband, where a fatwa condemning terrorism was issued. ‘Deoband has a history of being a nationalist seminary. This can be judged from the fact that its first graduate Maulana Mahmood Hasan established a government in exile in Kabul with Raja Mahender Pratap during India’s struggle for independence. The (special) train is to send the message of peace as well from the community,’ said Qari Usman. The Jamiat has been talking about national integration for quite some time. What does it want? Communal violence is the key issue for us as there are forces that are trying to divide the country. People are being beaten up, driven away and burnt. This is of concern. We are seeing people trying to terrorise whole communities on the basis of region they come from, be it Bihar, Bengal, North or South India. Issues like Maratha and non-Maratha are coming up. The government should deal with this situation firmly and there is a need for a comprehensive Act to punish such people who indulge in communal violence. You mean Raj Thackeray should be booked under terror Acts ? No. I am not naming anyone. But, they should be dealt with firmly. Though people like you say that terrorism has no religion, don’t you think the accused are always identified with a religion? Our stand is clear. There are some insane people who indulge in some acts and they should not be linked to any religion. Hindus are peace-loving and so are Muslims. Ideologically they can never become supporters of any terrorist act. The insane should not be seen as belonging to any religion. What about the cross-border terrorism? It’s the government’s duty to deal with cross-border terrorism. If it is not doing its duty, it’s their failure. Terrorism is one subject that can be dealt only through a holistic approach. Every stakeholder should be involved in the process. alking about national integration, do you see some threat to the fabric now? Yes. Some people are trying to disturb it. What are the issues that form your agenda for Jamiat’s conference in Hyderabad on November 8 & 9? There are many. Focus will be on national integration, communal harmony and on opposing terrorism. There will be a public meeting as part of the conference on the last day (Nov 9). Shri Shri Ravi Shankar will be the chief guest and Swami Agnivesh is attending. We have invited prominent leaders from all communities to address the congregation on the issue of national integration and challenge of terrorism and communalism. Leaders of other Muslim organisations such as Jama’at-e-Islami Hind and All India Muslim Personal Law Board have assured their participation. We are also running a special train, Shaikhul Hind National Integration and Peace Express, from Deoband to Hyderabad. This platform would help integrate the people of the country. After holding discussion with various organisations and eminent people, we will design a declaration. HINDU TERRORISM : IS IT AN ANSWER TO ISLAMIC TERRORISM? How many of the Muslims and Hindu organisations believed when I first raised the issue of possible emergence of Hindu terrorism as an answer to Islamic jihad? Not many were willing to buy that story. But it is true. Do you think that the militant among the Hindus would ever keep quite when the Muslims youth, though misguided, were on rampage with their series of bombing in city after city? It was not to be. There was a growing disenchantment and anger among the Hindus particularly the militant organisations like VHP and Bajrang Dal, known militant faces of the Safron Brigade, against serial bombing and killing of he innocent people. The world woke up to know that it was true when Sadhavi was first arrested for her alleged role in the Melagoan blast. The ATS of Mumbai police looked into this angle when six prayer going Muslims were killed when they were about to break their Ramazan fast in Melagoan. This town and Modasa was chosen by the militants because it was largely inhabited by Muslims. The blasts were shrouded in mystry as earlier there were blasts in Delhi at the same time. The attention was easily diverted to Indian Mujahideen, who were until then carrying out the blasts and two of their accomplices were killed in Batla House encounter near New Delhi. The suspicion grew, when more people were arrested including a Hindu Lt. Colonel and possibilities of other military personnel involved has not been altogether ruled out. Hindu terror has finally arrived openly for the first time. The arrest and subsequent interrogation of Sadhvi Pragya Singh, an Army officer and others for their alleged involvement in the Malegaon blasts of 2008 indicate the growing involvement of rightwing Hindu activists in terror acts. While the concept of 'Hindu terror acts' was relatively new, the fact remains that the first signs of Hindu terror came to the fore as way back as 2006, when a bomb went off while bombs were being assembled in a Hindu activist's house in Nanded, Maharashtra. But the police refused to look into this angle for they had no inlink to it and according to them they were not in their radar. The matter was hushed up. Had they taken notice of it and made arrests as they did now, the subsequent blasts would have been averted. During a narco-analysis test carried on those arrested in that incident, confessed and threw more light on how some Hindus decided to execute terror strikes, their modus operandi and the source of funding. Two of the accused have spelt out in detail the reason for them taking the terror path, and investigating officers say the causes were very similar to the one being attached to the recent Malegaon blasts. Manoharrao Pande, one of the accused in the case, said they were trained in handling explosive devices. He also said one of the persons, Himanshu Pande, who died while assembling the explosives, was a master at it. He said all terror attacks that occurred in the Marathwada region, including in Jalna, Purnea and Parbhani, were planned by Himanshu. some Hindu groups mobilised funds from locals. Pande said they had collected Rs 45,000 for making bombs and a minor part of this amount came from the money earned by the gym. He also mentioned that some right wing Hindu outfits and local political leaders supported them. Another accused in the same case, Bhanurao Vithalrao Choudhary, during his narco-analysis test spelt out the motive behind carrying out terror strikes in the country. He said the bomb that exploded by accident in Nanded was actually meant to target a mosque at Aurangabad the next day. He, too, mentioned Himanshu, saying the latter was the one who told them they needed to fight Muslim terror. Choudhary said Himanshu was perturbed by the fact that underworld don Dawood Ibrahim had got away unpunished and hence revenge had to be exacted. According to Himanshu, Dawood was responsible for the Gateway of India blast in 2003 which killed many. Sanjay said the motive behind the attacks that were planned by them was to safeguard Hindutva by targeting the Muslim population in the country. Aleem Faizee, social activist working for the Malegaon blast victims, said during investigation the police recovered a map depicting the Aurangabad mosque. Worse, the cops also found fake beards and Muslim outfits. The intention was to plant bombs under the guise of a Muslim to mislead investigators into believing that the bombs were planted by Muslims. Interestingly, the statements given by some of the accused arrested in connection with the recent Delhi blasts mentions that their leader, Riyaz Bhatkal, had told them the blasts were being undertaken only to avenge the Mecca Masjid blasts which, he believed, were undertaken by some Hindu outfits to shift the blame on Muslims. According to Faizee the recent developments in the Malegaon case and the revelations by the two accused raised a doubt regarding the perpetrators behind various other blasts that rocked the country. It is now clear that there was considerable scope for the rise of Hindu terrorism as an answer to Muslim terrorism. All along police has been suspecting the hand of Muslim youth in each and every blast as they were quick to make some arrests hours after the blast. This in fact emboldened the Hindu activists, as they felt that they can carry out any attack without being caught or noticed by the public/police since the entire blame would go to Indian Mujahideen. The greatest mistake done by the police was to look the other way when two of the Hindu activists were killed while they were assembling bombs in a house in Nandad, Maharastra. When pressed, the police argued that the Hindus activists were not in their radar for the present. Now the whole or majority of the blasts in Ahmedabad and subsequent recovery of unexploded bombs in large numbers in Surat and elsewhere point to the involvement of Hindu activists. There is every possibility of greater conspiracy against Muslims, taking advantage of the so called Indian Mujahideen owning responsibilities one after another. According to Faizee, the blasts that need to be probed are: Parbhani blasts of November 21, 2003.Jalna blasts of August 27, 2004. Jama Masjid blast in Delhi on April 14, 2006, Mecca Masjid blast, May 18, 2007, Ajmer blasts, October 11, 2007. Modasa blast, September 29, 2008. Malegaon blast, September 8, 2008.An impartial investigation into some of the earlier blasts would reveal that there were other players than Muslims involved in these blasts. Muslims writers, politicians, writers and journalists of repute have been counselling the Muslims about the danger associated with the youth of their community being involved in the serial blasts. These writers have been quoting extensively from the Holy Quran and hadits that Islam does not teaches voilence and that voilence begets violence. True it was but the recent revelation of Hindus involvement and the Hindu outfits working in tandem would put all these writers on the back foot as they now have to eat back their words. Here I am not trying to justify or support the dastardly acts of violence carried out recently. It was horrifying experience and the killing and mouning of the innocent does not in any way justified whatsoever may be the reason and cause. Since, the mood and involvement of the Hindu activists have been made now after the arrests of Sadhvi, it is now upto the Muslims intellegentsia to press for inter-religious dialogue so that such recurrance of violence or blasts could be averted. Mere condemnation of terror or issue of a joint fatwa would not help but an action to dissuade youth from joining the radical organisations that was responsible for misguiding the youth of the Muslim community. The local vigilant committee in each and every Mohalla mosque is necessary to drive away these jamats from preaching such radical views. It is the duty cast upon each and every Muslim parent to see that their youth are given modern education, whether boys or girls and they are dissuaded from joining such radical groups. Charity begins at home indeed. Hindu Terrorism / No one speaks about it ---- 2,50,000 Muslims killed in kashmir mostly young innocent men. Killed inside their homes / on the roads / in army camps / in indian jails . Govt records show only 35000 dead. Thousands of people Missing , no where abouts .. Govt is tight lipped .. Imunity to Army & police for killing Kashmiri Muslims. No cases filed, Thousands of Displaced kashmiri people for fear of being killed & economic Crush reasons caused by the Indian arms & the politicians. A sense of fear is among every kashmiri who lives there. One retaliation from a muslim is terrorism. & if a generation of innocent people is wiped by the govt it is accepted world wide & in this largest democracy as a Love towards Muslims. & muslims like Shahin sahib give a full lecture on terrorism. Every rebellion has been considered terrorism . Take a look since 1947 --Roits against muslims which shows ultimate hate & barbarism & after that no action from the Govt & the law enforcing agencies against the roiters, but after the roits arresting & torturing thousands of muslim youth for stone pelting who try to save themselves & their families from the roiters. with no security people are bound to take actions which they deem fit can protect them. Except for the likes of Osama Bin Laden and his supporters; and people like Dr.Zakir Naik who endorse his ideology with statements like "Every Muslim should be a terrorist" and "If Osama is terrorising America I am with him", Muslims by and large the world over have always condemned terrorism in all its forms, be it the torturing and killing of his own people by Saddam Hussein and the use of chemical weapons against the Kurds or the killing of innocent Iraqis at the hands of the American troops now in Iraq. Terrorism is different from Jihad. Islam has been the one of the biggest victims of terrorism in the form of Yazid 1400 years back, when he fought against and killed Imam Husain, the beloved grandson of Prohet Muhammad (SAW), in the battle of Karbala. The difference between Jihad and Terrorism is the same as that between the ideologies of Imam Husain and Yazid respectively. It's nice for Muslims to get together and issue a fatwa against terrorism. It's however not enough. Inorder to send a clear signal to the world community, Muslims need to explicitly oppose and disassociate themselves from all those practicing, preaching and promoting the radical Islamic ideology of the Osamas and the Naiks of this age, we live in. Only then will we be taken seriously. Fatwas and statements alone will not suffice. How about starting a thread/discussion on this???????? 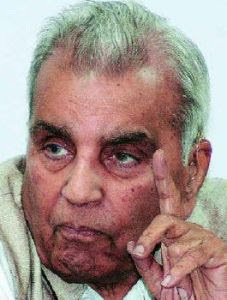 JUSTICE RAJINDER SACHAR, who headed the committee.